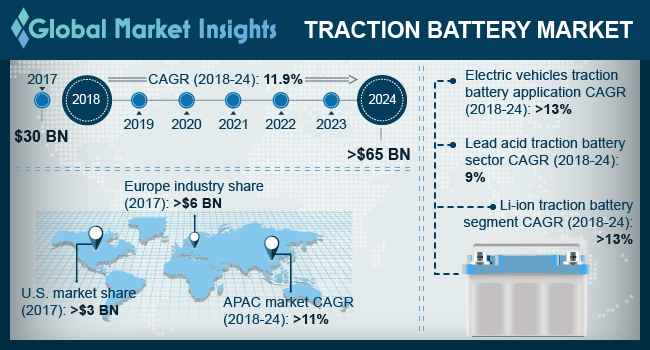 Traction Battery Market size will surpass USD 65 Billion by 2024, as reported in the latest study by Global Market Insights, Inc. Strengthening demand for electric vehicles due to favorable government policies and mandates will stimulate the Traction battery market size. Changing consumer preference toward electric forklifts to enhance industrial businesses along with decline in battery costs will fuel the industry growth. For instance, according to IEA, the global sales of new electric cars surpassed 1 million units in 2017, thus showcasing a growth of nearly 54% as compared to 2016. The U.S. market, in 2017 was valued over USD 3 billion. The Federal policies including purchase incentives and tax credits for EV’s will propel the industry growth. In addition, the reduced emissions and operational benefits from electric forklifts in the industrial applications will accelerate the deployment of these batteries. For instance, electric forklifts in U.S. accounted for over 60% of the overall lift truck in 2017. Li-Ion traction battery market is anticipated to expand over 13% by 2024. Growing investments to increase production capacity, sharp decline in price, and high cyclability will augment the industry growth. Li-Ion batteries play an imperative role in electrification of the automotive sector, owing to its vast applicability across electric vehicles and ebikes. China market is predicted to expand over 11% by 2024. The industry growth is largely attributed to the policies along with the introduction of tax incentives to promote the sales of electric vehicles. For instance, the national government, published around 39 policies since 2009 out of which nearly 50% were pertaining to electric vehicles , thereby facilitating the product deployment. According to the China New Energy Vehicle Development Project, ,The Ministry of finance, granted RMB100 billion to support the development of new electric vehicles during 2011-2020. Forklift traction battery market will witness growth on account of growing industrialization, driven by material handling industry and increasing penetration of ecommerce. In addition, the growing prominence of electric forklifts as a means to minimize GHG emission will further stimulate the industry growth. The ability to offer lesser emissions and lower operating costs in comparison to internal combustion models will further complement the business outlook. Favorable policy implementations and growing concerns to reduce the emission levels contributed by the transport sector will augment the market growth. Government led tax incentives ,ambitious manufacturing targets, and growing investments of automotive manufacturers toward EV development will further facilitate the large-scale deployment of these batteries. Notable industry participants in the traction battery market include Johnson Controls, East Penn Manufacturing, Exide, Samsung, Hitachi, BYD, LG Chem, Panasonic, Mutlu, Enersys, Systems Sunlight ,GS Yuasa, Amara Raja Batteries, Hoppecke Batteries, Haze Batteries ,Banner Batterien, Midac NorthStar Battery Company, amongst others.